“It’s a national shame,” rues Ali Akbar Peerbhoy, grandson of the founder of the Matheran hill railway, which plies the Matheran toy train. For today, the railway is struggling for survival. The red soil of the hill station, the horse rides, the silence of the forested hills are all under threat, along with the railway. A haphazard maze of crude roads and guesthouses has mushroomed on the pristine hill. Pushy touts and uncouth horse-ride vendors operate in flagrant violation of the law. The local authorities turn a blind eye to the ugly, skewed ‘development’. Matheran, Asia’s only non-motorable hill station and Mumbai-walas’ weekend getaway, has been reduced to a joke. 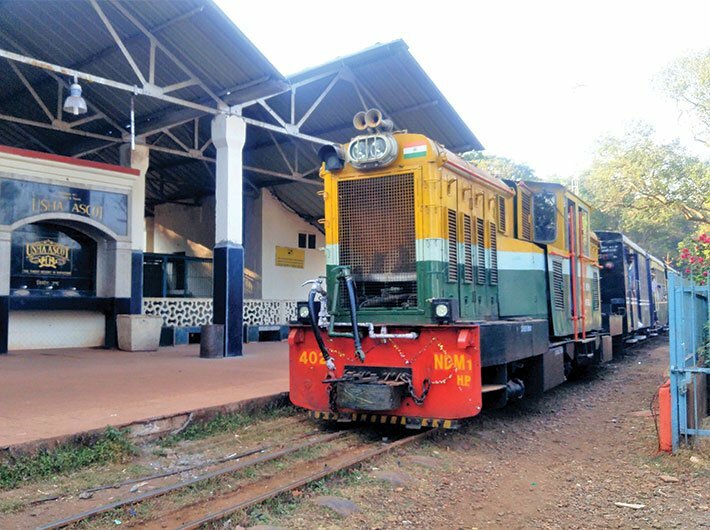 After months of talk of restarting the toy train from Neral to Matheran, which was shut down last May, the central railways resumed the service on October 30 last year, albeit from Aman Lodge to Matheran. The Neral-Aman Lodge stretch has been taking time: a lot of work remains to be done on the 127 degree curve there. Railway authorities say the full service would likely start in early 2018. Some 510 km of retaining walls and 732 km of stone walls have been built to protect the tracks and train from landslides. The overhaul has been budgeted at Rs 11.25 crore. It’s more than a year the service has been down; two derailments provided a reason for complete overhaul, including replacement of the engine and the entire stretch of narrow-gauge tracks. The United Nations Educational, Scientific and Cultural Organisation (UNESCO) designated three mountain railways of India as world heritage sites, as they are “outstanding examples of bold, ingenious engineering solutions for the problem of establishing an effective rail link through a rugged, mountainous terrain”. So, the Darjeeling Himalayan railway received the honour in 1999, followed by the Nilgiri mountain railway in 2005. The Kalka-Shimla railway was recognised in 2008. These three were included under the head ‘mountain railways of India”. The Darjeeling railway had opened in 1881, the Nilgiri railway was proposed in 1854 but completed in 1908, and the Kalka-Shimla railway opened in 1903. All three are considered “outstanding examples of innovative transportation systems built through difficult terrain, which had great influence on the social and economic development of their respective regions”. The Matheran toy train service was also on the tentative list. But its prospects are jinxed. A series of litigations initiated by Ali Akbar Adamjee Peerbhoy, grandson of founder Abdul Hussain Adamjee Peerbhoy, against the government over issues of renaming the station and validity of agreements with the then governor-general of India are pending in Bombay high court. He has written to UNESCO, questioning the legality of the sale of the railway and insists that the railway station be named after his grandfather. “UNESCO has reconsidered including the railway on its list,” says a disgruntled Ali Akbar. Plus, the discontinuation of the service for more than a year since the May 2016 derailment has not augured well for its heritage status. What’s more, the overhaul and repair of the railway means that UNESCO may not consider it a heritage site. To many, the buffer walls and the relaying of the tracks seem outright excessive. Without the train service, touts, taxi drivers, auto drivers and horse-ride vendors had a field day. Illegal construction began in a big way. The authorities turn a blind eye, saying the hill station needs development. But the law on the status is clear. Nobody in Matheran is permitted to build anything beyond the ground+1 level. And despite the law being flouted flagrantly over the last few years, the state remains silent. A petition from Bombay Environment Action Group is pending before the National Green Tribunal. The temporary resumption of the train service from Aman Lodge to Matheran is preposterous: it’s barely a kilometre, as opposed to the 21 km from Neral to Matheran. Nor does it serve any practical purpose: tourists anyway have to take a taxi to hop on to the train. And the horse ride, for which vendors charge Rs 1,000 one way, is through rough roads that would leave the aged and infirm shaken. The trip by car or auto is equally bad. The horse-ride vendors and taxi drivers have formed a strong lobby, levying fares as they will. They bend rules too: instead of the four passengers permitted in a taxi, they fill up six. Most are locals and had strongly resisted resumption of the train service; after all, their business would be affected. Matheran is a mountain table topped with a jungle ensconced in the Sahyadri range, about 20 square km with two thickly-wooded ridges, rocky structures and breathtaking views of valleys over 2,000 feet below. As the morning mist clears, these are revealed gradually. The native inhabitants were wild-forest races of non-Aryan origin and predatory habits such as Dhangars, Thakurs and Kathkaris. Even today, scores of women like Kamla, a native of Dhodhani village at the base of Matheran, transverses the treacherous pathway uphill, barefoot, every single day to reach Matheran market and sell the berries, mangoes or bananas she carries in a dusty potli. The natives of Dhodhani, primarily Kathkari tribals, speak Kathkari, of the Konkan family of languages, and are slim and wiry. Walking the miles to sell their wares, they are content with making Rs 50 daily. Matheran was explored as a summer resort at the same time as India’s first railway company (the Great Indian Peninsula Railway, now the Central Railway) was formed in 1849. After the construction of the Matheran light railway (MLR), it became a popular resort of the British Raj in India and still is. It traverses about 20 km from Neral (altitude 39.31 metres) to Matheran (altitude 803.98 metres). It falls in Raigad district. On a farcical note, hotel owners, who have been profligate with illegal constructions, are opposing a ropeway that is coming up from Bhivpuri, near Neral, right up to Matheran. It will be one of India’s longest ropeways. But now, the hotel owners say it would wreak havoc on the ecosystem! However, it has been cleared by the supreme court and the ministry of environment and forests, besides the public works department. Once the service is up, and the railway service resumed, the authorities would do well to crack down on unauthorised constructions. Else, this beauty of a hill station will meet the fate of many of the hills of Uttarakhand.